Representative Chris Gorsek is sponsoring an amendment to House Bill 3316 which calls for the Secretary of State to conduct a performance audit of TriMet. TriMet is no stranger to audits and welcomes outside review of our business practices. TriMet undergoes a multitude of federal and state external audits and reviews. 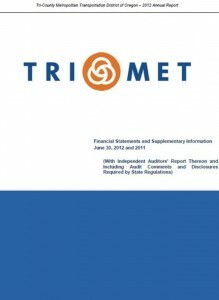 TriMet has never had an external audit conducted by the Secretary of State’s office, but the State requires that we have an annual financial audit, which is currently performed by Moss Adams – an independent third party audit firm, and we do submit our annual externally audited financial statements to the Secretary of State’s office. The last audit of compliance with Oregon Municipal Standards dated June 30, 2012. We receive federal funds for our light rail construction project as well as for other programs throughout the agency, which requires us to have audits by Federal Railroad Administration (FRA), Transportation Security Administration (TSA), Federal Transit Administration (FTA), the Oregon Department of Transportation (ODOT) and the Federal Office of the Inspector General (OIG). Last year, for example we were audited more than 10 times by federal agencies including the FTA and the federal OIG. The amendment requires that the Secretary’s Office complete the audit by January 2014. The audit is not an emergency audit despite an emergency clause in the amendment. In fact, nearly half of the bills introduced so far in this legislative session (1,226 out of 2,662) contain the emergency clause. This clause simply allows the legislation to go into effect when passed rather than waiting to take effect on January 1 of the year after passage, which is standard.